I finished the last few pages in my old sketchbook with some drawings of the corner of mums garden. 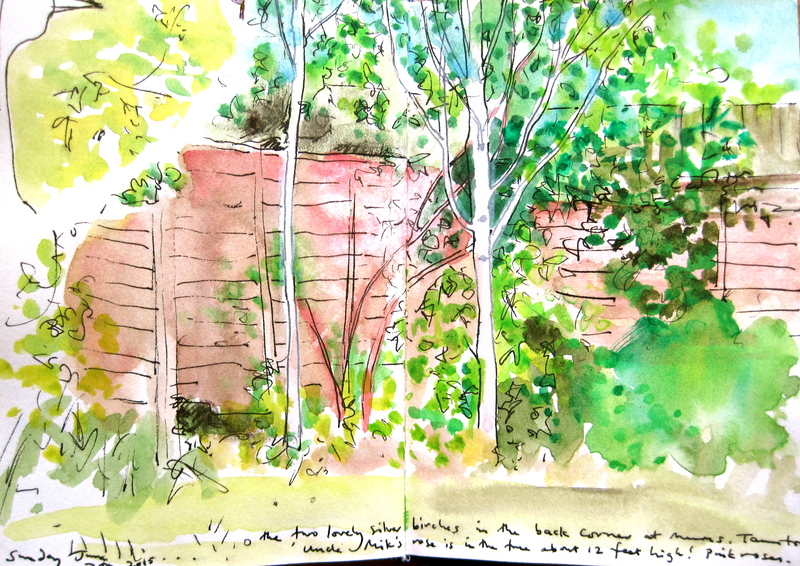 I had sketched the same view this time last year too.The garden is a bit overgrown and the old rose planted in memory of Uncle Mik has grown spectacularly high right up into the beautiful white silver birch trees. You can see a rose peeking out of the silver birch tree at the top of the last picture. [ Scroll down ]. I have other sketchbooks I use but feel lost without my favourite little book when it runs out! Back at mums recently I found the sketchbook I love in the art shop In Taunton! Yaay! Guess what I sketched on the first page! 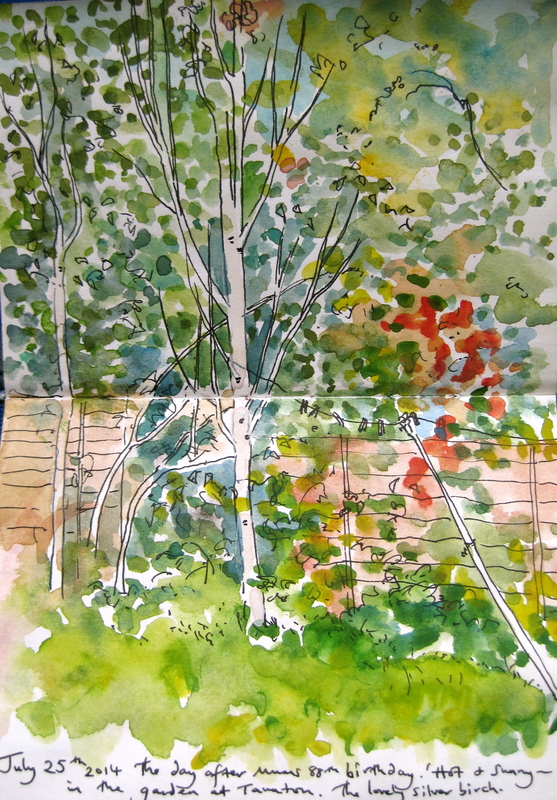 Corner of mums garden, the birches and the old rose. First drawing in my new sketchbook. 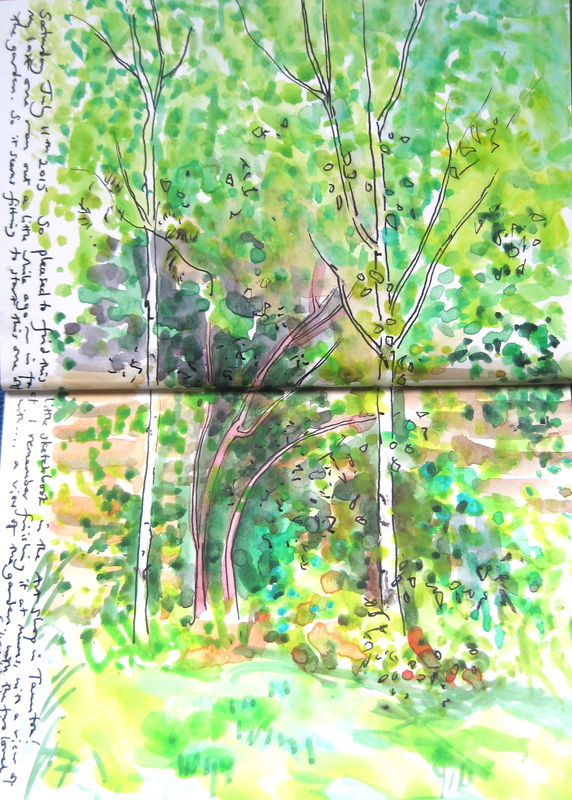 The silver birches, mums garden. Last page in my sketchbook. You can just see the neck and beak of the plastic heron from a sketch on the previous page. A corner of the paper has been torn off on the top left! The silver birches in the corner of mums garden. Sketched this time last year.